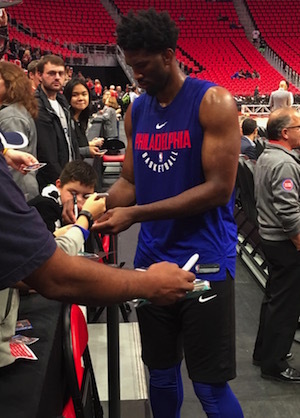 Lance Martinez of My Detroit Sports sends along this original photo of 76ers center Joel Embiid signing autographs. This happening took place recently at the Pistons’ and Red Wings’ brand new Little Caesars Arena, in midtown Detroit. A Joel Embiid autograph was a big get for fans who had arrived early on this night. The 76ers selected Embiid with the third pick in the 2014 NBA Draft, but wound up missing the entirety of the next two seasons, with chronic foot problems. The 2016-2017 season ended up being his rookie year. The Kansas alum played well in his first official campaign, scoring 20.2 points and grabbing 7.8 rebounds, but it only 31 games played. He missed the last part of the season with a bone bruise in his knee, but did manage selection to the NBA all rookie first-team. Over the offseason and somewhat surprisingly, the 76ers gave Embiid the max contract extension of a five-year/$148 million deal. In this early season, Embiid is still not playing in every game, amid averaging 20.5 points and 10.1 rebounds for the 6-4 76ers.